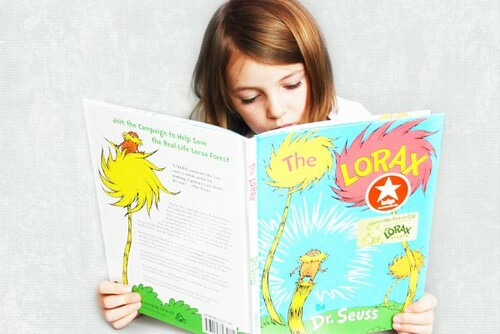 The first time I read Dr. Seuss’s ‘The Lorax’ was in my second year of University. My professor was giving a lecture on the importance of teaching children about the environmental impact humans have on the earth and referred to ‘The Lorax’ as the leading educational tool. I have to laugh thinking back to the first time I read ‘The Lorax’ to a group of six year olds. I was anticipating a light discussion on doing things like picking up garbage in the playground or making sure their families recycle. That is not at all what happened! We ended up spending the entire morning brainstorming ways to save the planet, and we were not just talking about picking up garbage. One idea that they came up with was to start an environmental campaign in our city schools that encouraged teachers to have at least one paper free work day a week. I have to say, I was shocked! I realized at that moment that my little group of munchkins with the brain capacity of, well six year olds, had the ability to help change the world. I am passionate about this book and the goals that they can set for not only children, but also adults. Conservation International, Dr. Seuss Enterprises, and Random House have launched a campaign to raise awareness of environmental issues and inspire earth-friendly action worldwide. Check out this site with your kids to see how you can help: www.theloraxproject.com. This entry was written by Melissa, posted on March 5, 2015 at 8:09 pm, filed under Kids & the Environment and tagged Kids. Bookmark the permalink. Follow any comments here with the RSS feed for this post. Post a comment or leave a trackback: Trackback URL. market competition; chip must save in hand, timely trial. Building repute on search engines is an effective way of digital marketing.